I purchased the PHD book some years back and am very interested in the ongoing advice and findings which embrace the PHD. Also, I find it always interesting to look at genetics. My late father – who ate a normal English diet all his life – was in his 91st year when he diedm having NEVER been ill. My mother dies at almost 100, having eaten a normal diet all her life and her sister was 107, having also eaten a normal everyday diet. Both mother and my aunt died from Alzheimer’s disease, otherwise they would have lived longer. So today, in this changed world we need to look at the PHD in the context of all that has affected our overall health. This is why I am a subscriber. I looked at the ‘Okinawa Diet’ decades ago and also noted the health regime of my martial arts teacher (Japanese) who was of very high world ranking. At the end of the day nature has provided an answer to perhaps every dietary question and in its ancient wisdom, knows best. Wild animals can feed without the need of instructional texts! It remains for us to discover the hidden agenda, much like the unknown universe beyond. But with caution. This is a very confusing infographic. Meat gets half the plate, yet makes up less than a quarter of the diet? Seems like a real plate would look much like the USDA myplate, except paleo and without the dairy glass. First thing in the morning I’ve been drinking the juice of 1/2 lemon in warm water. Will this stop autophagy? Paul, what do you recommend for a multi modular goiter? Can PHD help with this? Thanks! Hi just started the diet. I am a big guy. 6feet tall and 117kg and I am finding it difficult to eat 3 pounds of vegetables a day!? It seems like a lot. Especially the in ground sweet ones like beets or carrots. A kg of carrots lasts me a week. I don’t know how I could eat nearly half a kilo of them Per Day??? Does anyone else find this amount difficult to consume? I assume you mean 3 pounds of plant foods? PHD calls for 1 pound of starches (preferably tubers), 1 pound of sweet plants including fruit, and 1 pound of vegetables. The pound of sweet plants is equivalent to 3 pieces of fruit so if you eat a piece of fruit twice a day then you’ve cut down the number of carrots to 150 g per day which is the kilogram per week. Cooking the vegetables will also make it easier to eat them. I don’t think a pound is that much, you’ll see it goes down pretty easily in time. Thanks so much for answering Paul. I’m in Australia so I do get a bit confused about converting the weight of things from imperial to metric. So 3 pounds of plant food is approx 1.5 kilos correct? I think I need to get some kitchen scales. I still don’t know if I can eat that much plant food per day. 3 pounds is 1.36 kg. There are 2.2 pounds per kg. 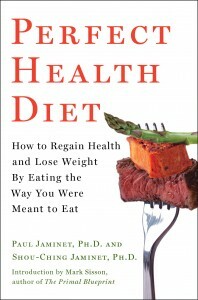 Does your book contain any advice about dieting to treat candida? I am on a low carb diet (100 grams a day) to treat it and I’ve read your post about how ketones will feed the candida. I’m interested to read more. Also, is brown rice a safe carb? The diagram only refers to rice. White rice only. The oils in the husk of brown rice tend to go rancid. I nearly died from the massive use of brown rice in the macrobiotic diet which may be cancer promoting for some. His teachings, Michio Kushi, were not sustainable for the human body that wants to thrive and be strong. Hi Paul. Due to being obese, I am attempting intermittent fasting. I had previously been eating a Paleo diet that meant breakfast was my largest meal and the meal at night was the smallest. Trying to skip breakfast has therefore been quite difficult. I guess it will get easier with time. My question though is if I finish eating by 6pm, is it OK and will the ketogenic fasting still work if I then eat again by 10am? You want to eat in an 8 hour window, but earlier in the day may be better. If you can eat 10 am to 6 pm that would be great, especially if most calories are around mid-day. Thanks again for replying. So I’m not better off having the 8 hour window for eating from 12 to 8pm? 10am to 6pm is how I ate anyway before starting PhD so that would be easier for me. Also any knowledge or ideas about game meats. In Australia that mainly means free range kangaroo, Buffalo, and venison. Thank you for your book and all your work. I am only on my first week of PhD but already feeling better. Sleeping well and energy levels more even throughout the day and I don’t go into the 3.30pm slump where I usually craved caffeine and sugar or wanted to sleep. I out this down to having previously been on VLC Paleo Diet. Can someone please tell me if yucca root/cassava is an acceptable safe starch? I can’t seem to find any info on this. 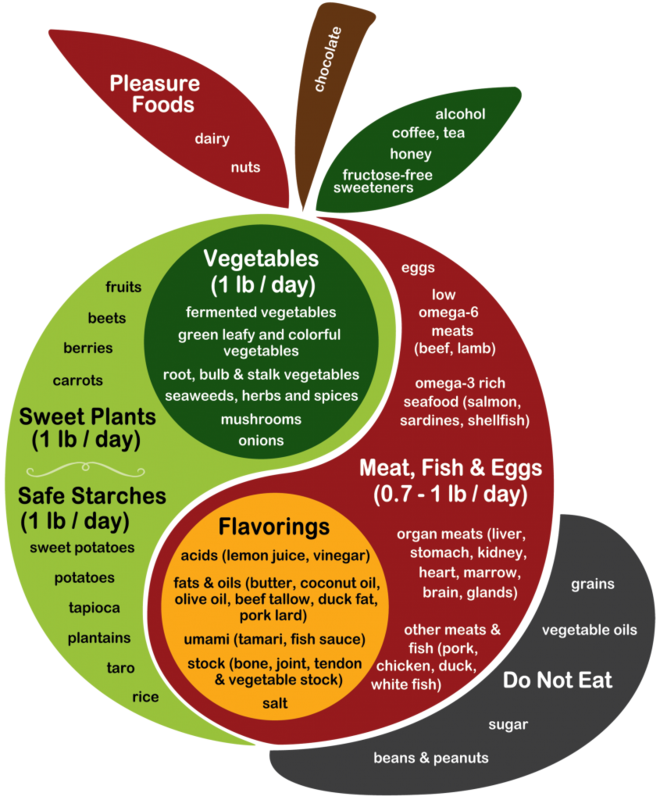 Also, I must follow a low oxalate diet, which pretty much eliminates potatoes, sweet potatoes and plantains. I can only do carrots in very small quantities. Has anyone been able to successfully follow a PHD and eat low oxalate at the same time? Paul – Do you have any suggestions for my situation? Thank you! As I’m digging deeper and deeper into PHD and reading more, I’m coming up with more questions! 1. I’ve been following Dr. Jack Kruse for a while and doing his “leptin reset” where I eat a huge breakfast with at least 50 grams of protein. Now I feel like my body is just so used to this and needs it every morning. This seems to negate PHD. Thoughts? How should I try to shift my breakfast? 2. Are there any examples of what meals should look like? I’m a 40-year old female, 128 lbs. I’d like to lose maybe 5-10 lbs, so I don’t think I should be eating a 2,000 calorie diet. Is hemp protein powder ok? Has high magnesium content at 60% rda. Tried taking the magnesium citrate and messed up my sleeping pattern. I don’t know anything about hemp protein powder in particular, but PHD is usually suspicious of plant protein. But if you want to get enough magnesium without taking supplements — I do know you can get enough magnesium just from ordinary PHD foods: For example, I obtain about 550 mg / day of magnesium by eating tubers for safe starches (which have more magnesium and other nutrients than white rice), in addition to eating double the suggested quantity of low-calorie vegetables — including butternut and acorn squash, which are high in magnesium; and a variety of green vegetables like spinach, chard, kale, seaweed, avocado, broccoli, etc (all of which are rich in magnesium because magnesium is required for the function of chlorophyll, which is what makes these foods green). And if you don’t like these, other PHD food sources of magnesium include chocolate and many brands of mineral water. In the afternoon in bed at 5 or 6. I was averaging 4-5 hours sleep on week days before taking the citrate. After taking it for two weeks average of 2 hours during the week. I didn’t realize that… PHD generally suggests synchronizing food intake, light exposure, and activity, which improves sleep quality. I would imagine that you could eat before work, install some bright white lights (or a light box) at work, eat again and get some sun exposure in the morning after work, and stay inside in the afternoon and block sunlight from entering your window. Full sunlight is very bright; even room darkening curtains won’t suffice — try a piece of cardboard cut to the size of the window, some flaps made out of aluminum foil or dark paper to cover the inevitable gap between the cardboard and window frame, and then hanging a blackout curtain like https://www.amazon.com/AmazonBasics-Darkening-Thermal-Insulating-Blackout/dp/B0153TOMRY/ref=sr_1_3?ie=UTF8&qid=1507653245&sr=8-3&keywords=amazon+basics+blackout+curtains over the whole thing. Once you’ve blocked the sunlight, you could use amber bulbs like https://www.amazon.com/Feit-Electric-A19-LED-Orange/dp/B00GOZYCY0/ref=sr_1_2?s=hi&ie=UTF8&qid=1507653492&sr=1-2&keywords=Feit+Electric+A19%2FO%2FLED to provide dim non-melatonin-disrupting light in the early afternoon, until bedtime at around 2 or 3 PM. But I don’t have any personal experience with shift schedules, so take the above suggestion with plenty of salt. I have been wondering if I should start this diet, the diet I’m currently on is really close as I bought the book, but adjusted the portions to my liking. I work out almost 4 hours 5 days per. week, the amount of nutrition I need high. What’s your opinion on diet for someone who is very active in sports? I’m already doing intermittent fasting, from 10-11 at night to 12 the next day. Hi! Would this program be good for someone without a thyroid? It was removed in 2008 due to papillary thyroid cancer and Hashimoto’s. I keep gaining weight even though I am not an over eater, junk food eater, etc. I need to lose about 20 pounds. I’m 50 years old. I’ve always suspected that although I keep getting heavier, I am actually “starving” – that’s why I thought the Keto Diet would be good with the heavy fats, etc. but it hasn’t helped at all. What do you think? Thanks! Hi Kelly, my wife had papillary carcinoma of the thyroid in 2001 right after the birth of our daughter. She too is 50. She has been doing regular PHD with me for almost 2 years. She too at times struggles with her weight, but considering her history she is doing very well. The problem is that you are most likely still hypothyroid, and until you fix that no matter how well you eat you will lose very little to no weight. Talk to your endocrinologist and ask him or her for a T4/T3 combo. If they disagree, find another Dr. Hang in there and continue PHD. Hi, Bob. I AM still hypothyroid – my TSH as of a month ago was 12.59 and Free T4 was 0.7. Those are the only two things my endocrinologist checks. Does your wife take desiccated thyroid? Iodine? I’m happy she is doing well – my levels haven’t been stable since the surgery which is why I started looking into nutrition. I’ve been eating keto for over a month but recently, I’ve learned it is actually bad for someone like me so now I’m ordering the PHD book. Ugh. Thanks for your reply! what do parsnips count as? safe starch, sweet plant or root? Thanks for the book and everything you’ve put out! Sweet plant would be more accurate than safe starch or vegetable. Parsnips have about 50 fructose calories plus 200 glucose calories per pound. So if you wanted to be overly precise, you could call them 50% sweet plant + 35% safe starch + 15% vegetable, or something like that. Thanks Eric. Is there a good place to find nutritional data like you have above? Then adjust your preferences to show some useful information hidden by default: Click on the “Profile” tab, and scroll down to the box labelled “Nutritional Targets”. Under the “Vitamins” tab: For vitamin A — check the “visible” box on the line that says “retinol”. For choline — check the “visible” box. Under the “Carbohydrates” tab: Uncheck the “visible” box for starch and total carbs; instead check the “visible” box for net carbs. For sugars — uncheck the “visible” box for total sugars, and instead check the “visible” boxes on the lines saying fructose, galactose, lactose, and sucrose. Back on the “Diary” tab, click on “Add Food”, and enter 16 oz (1 pound) of parsnips. Glucose calories = (Carb calories) – (Fructose calories) – (Galactose calories) = 237.6 – 48.4 – 0 = 189.2. So about 200 glucose calories plus 50 fructose calories, as I said. As a bonus, you don’t have to do this individually for each food. Just once for all the food you eat that day. By default, cronometer will show red if you’re eating more than their target for a given nutrient, yellow if you’re eating less, and green if you’re eating within their suggest range. To make this more useful, you could change the targets to match PHD recommendations. I did not set targets for the individual sugars. But you can calculate fructose, glucose, and galactose calories as I described above, and compare them to PHD recommendations. Amino acid data in cron-o-meter is missing for soup stock, tendon, and everything else rich in extracellular matrix, making it of limited usefulness for PHD dieters. Tracking of B12 is not useful, because most cases of vitamin B12 deficiency are due to problems with absorption, not to inadequate intake. Tracking of vitamin D is not useful, because it comes primarily from sunlight, not from food, and PHD suggests blood tests anyway. Tracking of iron is not useful, because most cases of iron deficiency or excess are due to problems with absorption, not to inadequate or excess intake. Dear Paul what is a Typical meal for you lately?? ingredients?? I just ordered your book and may find the answers to my question there, but I thought I’d ask here anyway (I’m impatient!) I have some kind of candida/dysbiosis in the gut and bladder. I’ve been on a very low carb diet for 2 months now (which has helped a lot) and am going off it now and switching to your diet, after having read your blog about the risks of VLC. Just had some rice, we’ll see how it sits with me. My question is, how much carbs do you recommend when overcoming candida? Is it the same as your overall diet, or less? I tried to find a post on this on your site, and forgive me if I missed it. I don’t see a candida category on your list of diseases. Thanks so much for your extremely helpful blog. I am 44 years old and gained 25 pounds in a year. I recently found out that my thyroid is week and I’m insulin resistant, my numbers indicated that I am close to being prediabetic. My husband and I followed PHD for about a year in 2014 (After that we continued to eat approved foods, but not in the correct quantities). He lost about 25 pounds in 3 months. Although, I didn’t lose weight, I felt good and ran a mile a minute faster than I ever have. The best thing for my current issues is to lose this 25 pounds, but it won’t budge. I tried keto and intermittent fasting for two months and lost nothing. I’m back on track with PHD, but the scale won’t budge. Do you have any specific advice for insulin resistance? I’ve lowered my calories to 1200, having a hard time deciding on how many grams or percentage of each macro. If I reduce the fat a little to reduce calories, change macro percent to 35 carbs, 25 protein, 40 fat? I need to start losing so I can fix my insulin resistance and be healthy again. Hi Serena, my advice for insulin resistance can primarily be found in this video: http://perfecthealthdiet.com/2014/08/ancestral-health-symposium-tak-weight-loss/. As Bob says, you should get your hypothyroidism treated with replacement hormone, aim for a TSH between 1.5 and 2.0. 35% carbs, 25% protein, 40% fat is fine for weight loss. Don’t focus on weight, focus on health. If you were able to increase your running speed, that is a good sign of improved health. For prediabetes, be sure to do intermittent fasting, circadian rhythm entrainment, optimize vitamins A and D, supplement vitamin C, taurine, N-acetylcysteine, and glycine, and 2 tbsp vinegar and 3 egg yolks per day. It’s been said many times that if your thyroid hormones are not in check, it may be impossible to lose weight. I would get your levels tested and to start get on a T4 supplement and go from there. It may be all you need. Minced beef is inexpensive; rice, potatoes and beef dripping likewise. A can of sardines in tomato sauce gives 3 grams of Ω3’s for pennies. Carrots and onions are key vegetables that cost very little. That’s 2/3 of the day’s kcals at quite low cost. 20 servings of dried fruit might cost the same as a serving of fresh berries in my locale (fits the macros if you properly monitor the sugar content of the servings). I have painful bladder syndrome as well as some kind of gut dysbiosis (they’re clearly linked, possibly due to candida which a stool sample in September showed I have lots of). After 2 months on VLC, which dramatically helped, I switched to PHD in late November because I luckily found your blog and realized I desperately needed some carbs, my brain was craving for glucose. I can tolerate rice, but root veggies give me bladder flare-ups (increased need to urinate, dull pain in bladder immediately after eating). Also some aggravation of the gut symptoms. I’m thinking it must be due to the slight fructose content. I’m entirely off all fruit and sweet foods. I’m currently reading your book and following PHD as much as I can without triggering bladder symptoms. Do you have any advice going forward? I’m a bit concerned that without more carb intake I might develop insulin resistance if I continue like this too long. I’m taking oregano oil which seems to help somewhat but doesn’t get rid of the symptoms. Some keys to gut health and anti-fungal & urinary tract immunity are: vitamin A and vitamin D optimization (liver, sunlight); glycine, taurine, N-acetylcysteine (for bile and glutathione and extracellular matrix repair); vitamin C; zinc and copper optimization; iodine; healthy acids (vinegar, citric acid from citrus fruits, malic acid); 3 egg yolks per day; intermittent fasting; circadian rhythm entrainment. Avoid any yeast or fungal containing foods (e.g. blue cheese, kefir) but it’s fine to take bacterial probiotics, just don’t overdo it. You might consider getting a skin probiotic such as AOBiome’s Mother Dirt and spritzing it on the outlet of your urinary tract once a day, this may help repopulate the bladder with good bacteria, along with the vitamin A and D and other supplements above. Hi Danielle, you should definitely be sure to get adequate carbs, and try to increase variety. Quinoa is fine in your situation. Thank you so much… for being there! I’m a little confused as to how the amounts in here work out to roughly 600 carb calories. Carbs are 4 calories per gram, and you’re recommending around 450g safe starches. I appreciate these aren’t purely carb, but something like rice will have around 80g carbs per 100g. No, you’re thinking of dehydrated uncooked rice. Typically our starchy plants including rice have about 100 to 150 g carbs per 450 g weight, and other plants are lower. A comment as I read your (excellent) book: it would be worth taking a look at the unlabelled contents of wine, and warning your readers that when they enjoy wine, they should make sure to drink organic. There are a ton of chemicals added in the winemaking process that trigger headaches and other reactions to toxins. Producers are not required to list the additives in wine… it’s one of the only foods for which this isn’t required. I’m a wine professional and know about this. Most large conventional producers (and some small ones) create a chemical cocktail in the lab. Many people just ascribe their bad reactions to either alcohol or sulfites, but most likely they’re due to a mess of chemicals. Sulfites (labelled because some people are very allergic to them) are entirely benign if one’s not allergic, whereas the other unlabelled chemical cocktail is toxic. Conventional wine makes the brain feel dirty (and it’s not due to the alcohol, if you’re drinking in reasonable quantities!) whereas organic wine may give you a buzz from the alcohol, but doesn’t make you feel brain-injured. Especially when we’re doing so much to rid ourselves of toxins, it’s a shame to then have a few glasses of poison. Also for info, “organic” only refers to the agricultural part of the process (no pesticides etc) and there currently exists no label/control for wines that are vinified naturally, but most often small organic producers don’t do too much manipulating in the vinification process. Giant producers of “organic” wine are less trustworthy. Just something to take note of. Also, many white wines also contain a lot of sugar, which we’re trying to avoid. (Literally sugar… I have poured many big bags of refined white sugar into vats of fermenting wine, while working at a winery.) Yes, much of it ferments out and converts to alcohol, but much of it also remains as residual sugar, to please the consumer’s sweet tooth. The best wines for health are organic red wines made by small producers. If white is necessary, go for truly dry organic white wines (such as some sauvignon blancs) made by small producers. Any particular grape/variety you recommend? I’ve seen Pinot Noir and Cabernet Sauvignon recommended. I imagine because of supposed higher resveratrol content. And also French and Spanish produced wines of that variety recommended – I imagine because Australian wines are typically very industrial scale – so you’re more likely going to get small traditionally wineries in Spain and France. Don’t see why Italia can’t be included though. The grape variety choice is really one of taste, whatever you like best. There are minimal differences between varieties regarding health. I suppose the best would be to vary them, to get the benefits from all. I’m sure the lesser-known ones have plenty of nutrients too, they just haven’t been subjected to as much testing as PN or Cab. The only important health difference is in the sugar level in some white (and pink) wines — chardonnays, pinot grigios, viogniers, and hot-climate wines, for ex, tend to be higher in sugar. Trends have been going more toward sweet wines lately, too, especially among inexpensive wines. Mostly, avoid large industrial wines from anywhere. Spain actually has a lot of industrial-sized producers — most of the inexpensive Spanish wines on the American market are made by giant producers. You’re right that Australia is very industrial. California too, which is in my opinion one of the worst deals (quality/price ratio) in wine. My favorites are small organic French producers, of any red grape variety — best quality for price. Italians are less likely to be organic (and Spanish even less so). But I’m generalizing brutally — there are many exceptions. I have been working to rid myself of a systemic yeast infection for over a year that was triggered by a ketogenic diet. Searching for answers brought me here. I finally bit the bullet and bought the Perfect Health Diet. I have been binge reading it for the past few days but found I still have a couple of questions, and I’m hopeful you will be able to answer. What is your stance on food intolerances? I have several including dairy and eggs (both the whites and yolks). I see that you recommend 3 yolks per day. I read the section in your book that said most intolerances are triggered by wheat. Do you think it’s ok to consume these items that are known intolerances? Additionally, I assume your response to Danielle on gut health Dec 16, 2017 would apply to me as well in my journey to rid myself of my systemic yeast infection and work towards curing my leaky gut. Thank you so much in advance for any advice you might be able to offer. Do you still believe a lower carb high fat diet is optimal for health? Compared to say a high carb starch based very low fat diet? could be unsafe to drink calcareous water? In my region the water is very very calcareous: could it be better to drink just mineral water in bottle? Do you have any input on dealing with an extremely high mercury toxicity? Would you make any changes to the diet and/or supplements? Thanks so much! Love your book, Paul. I read it cover-to-cover in a matter of hours – just couldn’t put it down! I really want to try following the PHD as much as I can. I have a lot of digestive issues and find I must eat a low histamine, low oxalate and low FODMAP diet. This really limits my choices! Fortunately I can eat white rice and yucca root, so those two will be my safe starches. I have been trying for years to heal my gut and have had little success. Recently after having gone off a ketogenic diet I was finally able to introduce a few more foods, but then I developed the FODMAP issues. I’m certain I must have some kind of gut infection, but I’ve had multiple stool tests done with naturopathic doctors and nothing has ever been found. My family all seems to be developing a lot of stomach and other issues lately as well. 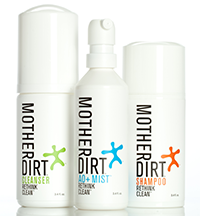 We have all had hair tests done and told we have high heavy metals. 1. What kind of testing would you suggest to determine a gut infection? I do find I feel much better WITH carbs – could this be an indicator of a fungal infection? I definitely cannot handle vlc. 2. How important are veggies to the PHD? Like I said, I am very limited and can only eat small amounts. I just don’t digest many very well. I’ve gone through all of this. My advice: if you’re still having trouble reintroducing certain plants, back off, and consider a temporary meat only diet. Maybe a few weeks to a month. No supplements, no probiotics, etc. Just fatty cuts of meat. If like me, you probably react to coconut oil, olive oil, etc. I was fine with butter as a fat source(no salycilates). However, I would just stick with fatty cuts of meat like ribeye steaks, pork belly, etc. If you’re ok with eggs, eat them as well. You should notice massive improvements. Then you can go ahead and reintroduce some starch. Start with white rice(as you’re ok with), then white potato, followed by yams. You will have to experiment with different non starchy vegetables, and figure out what works best for you. However, as far as starches go, the above is plenty. Some of the others may be more problematic. I would think a month would be sufficient in knocking out any rogue bacterial overgrowth, etc. that may be derailing your efforts. As always, experiment, and find what works best for you. Good luck! I hope this was partially helpful. Fish oil still confuses me. It goes rancid quickly if sitting on a shelf. What happens to it after you ingest it, & it gets incorporated into human tissue? If the body is 98.6 degrees then won’t you just have rancid oil in your tissues, or does it stay fresh in the human body somehow? All food/oils go rancid …? Yes, but when we eat a salad for example,(which will rot quickly on the kitchen counter), if we die & they do an autopsy, they won’t find a salad in our tissues. But when we eat fish oil & other oils apparently the oils are assimilated into human tissue & would become part of our body. So if we died & had an autopsy is the fish oil in our tissues rancid, or does it stay fresh somehow? Would you mind sharing what your first meal will be today..ingredients?? Why are oats bad for you? Does this include British oats? I am reading your book but I am confused why oatmeal is on the forbidden food list? Hi Stefan, oats are not so much forbidden as considered a marginal food, I think we gave them a grade of C on a scale of A-F. This is due largely to a prejudice against grains which co-evolved with mammals and tend to be rich in digestive inhibitors targeted at mammals, as discussed in the book. However, oats appear to be the safest of the cereal grains. I would just add that avenin contained in oats can be extremely problematic for individuals with digestive disease. If you are an individual who reacts negatively to gluten containing grains, I would imagine oats, certified gluten free or not, would pose a major risk. I recently tried reintroducing steel cut oats after a six year hiatus, and suffered neurological symptoms within several hours of ingestion. After two servings, the side effects were severe. Best of luck with the diet(it’s a great one). Paul, I hope you’re doing well! Organic Peanut Butter with no other additives. Is it still unhealthy to consume. I love peanut butter and eat it quite often. I also eat Almond butter but not as often. I would like to know if I should stop eating and change my habit. We recommend nut butters from lower omega-6 nuts (such as macadamia nuts, cashews, almonds) rather than peanut butter. Yes, we recommend switching. Is Quinoa on your “safe” grain list? Or Basmati Rice? Rice is, for quinoa see http://perfecthealthdiet.com/2010/09/the-oldest-profession-quinoa-millet-and-emmer-and-einkorn-wheat/. When should we have the largest meal of the day? Is it necessary to manipulate the suggested macros to gain weight? I am underweight with small appetite Ectomorph). The largest meal should be around the noon hour. PHD should be good for weight gain — try increasing saturated fat, protein, and carbs. After years of ignoring clear cues from my body that high fat/PHD was the way to go for me, I recently adopted this way of eating and feel great. No more bloating, my food tastes better and more satiating than it has in years. One very odd shift, though. My taste buds seem to have changed quickly and drastically. Suddenly all coffee tastes like burnt ash. Red wine almost has no flavor. Carrots and bell peppers taste as sweet as candy or fruit. Is this normal in adopting a high fat diet? Just curious as it’s been very pronounced! Hi Sarah, great news on the improved health. Becoming much more sensitive to sugar / less attracted to sweets, as with the carrots, is normal. Coffee should still be tasty, although you may need to find one that is less burnt (i.e. avoid dark roast) — less burnt is healthier so that could be a good change. I have no idea why wine would have lost its flavor. What many people don’t know is that coffee is a perishable product, like bread. Mass market coffee producers pre-grind sub-optimal, old coffee and roast it to death to cover up the taste defects. Coffee “beans” are the seed of the coffee cherry and as such should have a fruity or nutty flavor. Try your local specialty coffee shop and see what you think of their wares. Congrats on getting your taste back. I appreciate the work you and your wife put into this website and your book. I am very much indebted, as I have benefited greatly. Thanks! How do you treat milk sugars in regard to limiting total sugar intake? For those of us that drink a cup or two of milk per day, would you consider the 12 grams/cup as part of the 50 grams total sugar recommended per day? Yes, galactose is probably worse than fructose, and is also processed in the liver, so you should count it against the fructose allotment. I’m confused about the diet. Yes I have listened to the audio book AND I have a copy of the book. My confusion comes in when I go to look for certain foods. The food diagram is great but not detailed food lists. Is there a place that lists like this exist on the page or somewhere else? Thanks for all the help. I am totally new to giving up grains but in the few days I have I can tell a big difference in my digestion. That said, I’ve been on almost every other diet out there without relief. What is your attitude towards seasam seeds and chickpeas – the main ingredients for humous ? Sometimes I like to eat raw taxini straight from a jar. hi, im very interested at looking to start PHD as i have trouble losing weights, I currently use Huel for calorie counting which is a complete food source but this consists mainly of Oats, pea protein, flax seeds, brown rice protein and MCT. Im guessing the ingredients Oats, pea and brown rice are not advisable with PHD? I’m finding it extremely difficult to construct a meal which is close to the macros you recommend in the book. For my lunch today I had rice noodles, ground beef/liver mixture, cheese, tomato sauce. It sure sounds & looks like something you’d recommend, but it’s nowhere near the correct macros. I would have to add 4 tablespoons of butter to this meal to make it fit the percentages recommended in the book. Even adding 3 egg yolks instead of butter doesn’t get it anywhere close to the correct macros. I have this problem with all of my meals. Just looking at another example. 1 Cup Rice, 1/2 LB Atlantic Salmon, 1T Coconut Oil (25% carbs, 35% protein, 39% fat). Only way this meal works is to add 5 T of Butter & up the rice to 2 1/2 Cups. I’m really confused. Am I supposed to add 4 or 5 Tablespoons of butter to every meal? I would suggest replacing some of your meat/fish with fatty tropical plants — avocado, coconut meat, macadamia nuts, etc. — 1 cup of rice + 1/4 lb atlantic salmon + 1 oz macadamia nuts + 1/2 oz unsweetened (or dark) chocolate. …And while these examples get about the right protein/carbs/fat ratio, they aren’t “complete PHD meals” — missing food groups include extracellular matrix (e.g. soup stock), sweet plants, and low calorie vegetables. Ty for this great post! Frankly, I’ve made myself really sick (hypothyroid) with 6 years of keto, even eating 1800 calories a day. I’ve just crashed. My functional doc put me Levothyroxine & told me to switch to PHD. But how to get there? 1/4 lb salmon, 1/2 avocado, 1 egg, and 2 bites of rice – then I’m STUFFED. Like, I need a wheelbarrow. I can’t finish the rice or get in more eggs & plants. I need to just eat more, but how? Do you have as my advice for those of us recovering from keto-wreckage? Ty. As a general rule, you can trust your appetite. It’s hard to give additional advice without knowing more about your situation. However, you may need extra carbs, extra extracellular matrix, and extra vitamin C for a while. Good supplements may include 3 egg yolks per day, vinegar, taurine, N-acetylcysteine, glycine, vitamin A or liver, vitamin D or sunshine, a B-50 complex once a week. Does PHD endorse Kombucha consumption? I think Paul favors kimchi and fermented veggies over kombucha. Ty Paul! I do eat liver & drink bone broth already. I can start the rest next week. Happy Easter to you. Best wishes! I try repeatedly to eat beef liver for the nutrients but I can’t stand the taste and I’ve tried cooking it all different ways. If it is so full of nutrients, why do most humans not have a taste for it? Is there a way for someone’s body to change its “mind” and like it? I think it’s a bit of a stretch to say that most humans don’t have a taste for it. I personally love it. If the liver taste is very strong or metallic perhaps it is old. If you source grass fed beef liver from a butcher you might have a better experience. Good luck! I finally found a way to eat nasty beef liver. My grocery store mixes 1/4 lb grass-fed beef liver with 3/4 lb grass-fed ground beef for me. It actually tastes good. Old liver always tastes metallic, as mentioned above. Key to get fresh veal liver. If beef or lamb liver is all that’s available, try making homemade pate, which is easy to do in a blender. Just blend up the ingredients, decorate with bacon, pour into a loaf pan & bake! We blend 1/2 liver withb1/4s ground pork & beef, add eggs, herbs, chanterelles, cream & a tablespoon of cognac. Hi there, what an interesting read your gut health article has been. I’m assessing what will be the best dietary intake for me, following removal of most of my colon late last year. This was due to a cancerous growth and is not the first time I’ve dealt with cancer. Currently undergoing chemotherapy which is due to finish in June of this year and looking to the future, specifically how to restore a balanced gut, given the major changes that have occurred. I have been taking a practitioner prescribed probiotic throughout treatment, along with other supplements to best support me through the treatment. Given my “colonic issues”, would this dietary approach assist me to restore my gut? Hi, I was just diagnosed with white matter on my left lobe area by a radiologist, I have not seen the neurologist yet, can this diet reverse white matter on the brain?? We don’t know, it is very hard to determine the answer to such a question without running a $100 million clinical trial. All we can say is that PHD is a healthy diet, close to the optimum, and it will help you. We don’t know how much. But I think most M.D.’s would be extremely surprised how good our diet and lifestyle were at reversing health problems in our retreat guests. So I would give it a try.